The March for Science 2018 mobilized supporters across the globe to speak up for science. 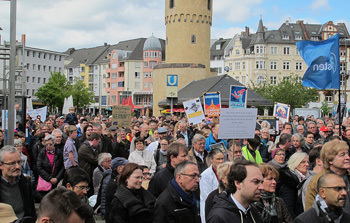 Also in 19 German cities there have been demonstrations and activities for freedom of science. This year, the main focus was on the exchanges with non-scientists. Over a million people worldwide protested for the freedom of science in April 2017. This is how massive the response to the first March for Science was. It was not just about Donald Trump, although the American president did have an influence on the discourse after only a few weeks in office. His attacks on science produced an outcry and motivated many demonstrators to take a stand against "alternative facts". How is the movement doing now after spontaneously emerging from the Internet and garnering support worldwide? In Germany, the numerous initiatives by volunteers resulted in a non-profit organization. This year, activities have also been held in 19 German cities for April 14th, 2018. The organizers were not only focusing on demonstrations, but also on dialog. Discussion events and interactive talks are expected to strengthen dialog with the general public, because the waning credibility of science across broad sections of society can also be blamed on hiding in the ivory tower. "A credibility vacuum can be filled with fake news and thus threaten our democracy. 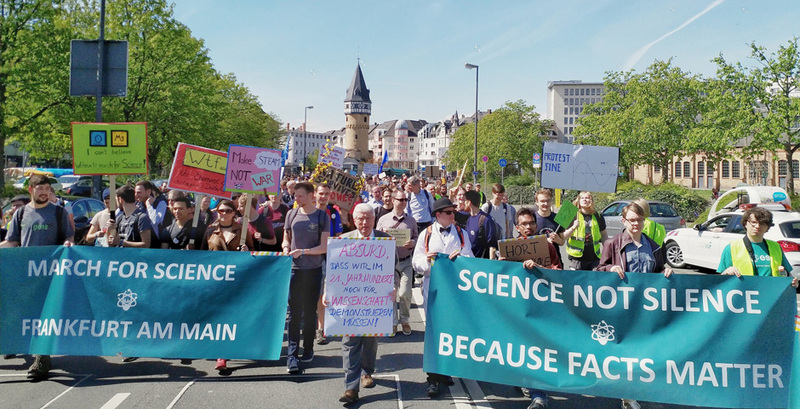 The credibility of science depends on trustworthy scientists who communicate transparently," says Claus Martin, head of the non-profit organization "March for Science e.V.". Two projects in Berlin and Frankfurt show how this could work. There have been no demonstrations in Germany’s capital this year after nearly 11,000 people protested for science last year. Instead, the "Kieznerds" project has worked to bring scientists and citizens together in round table discussions. For organizer Eve Craigie, this is the logical next step after the march. "We don’t just want to hold up posters with slogans," she says. Instead, we need to expand on the interest that has been awakened. "We want to bring scientists and interested citizens together not in a stuffy academic manner, but rather as equals in a personal setting," explains Craigie. About 25 scientists have agreed to answer questions from interested citizens in the comfort of their favorite, local neighborhood bars. This year in Frankfurt, the classic March for Science has been supplemented by a Science Arena. The idea is as follows: Experts were available at five booths for Q&A’s regarding climate change, biodiversity, vaccinations, conspiracy theories, and the effects of nationalism on science. "The message is ‘we are here, ask us’," explains organizer Susanne Ficus. "Scientists speak their own language. It is too complex for many citizens. We want to foster conversation." Additionally, conventional marches took place in a total of eleven cities – Braunschweig, Bremen, Kassel, Koblenz, Cologne, Munich, Münster, Neuruppin, Saarbrücken, Stuttgart, and Trier. In the Ruhr area, the University of Bochum has organized a panel discussion on 04/13/2018, the day before the actual March for Science. The event was titled "Vertrauenskrise? Die Bedeutung von Kommunikation zwischen Wissenschaft und Gesellschaft" (A Crisis of Trust? The Importance of Communication Between Science and Society). In Darmstadt, there weren't any activities on 04/14. Instead, a discussion titled "Wer treibt hier wen? – Digitalität in Wissenschaft und Gesellschaft" (Who is Driving Whom? Digitality in Science and Society) took place two days beforehand at TU Darmstadt. Several activities were planned in Dresden. In addition to the conventional science march, there was an "ideas forum". At the forum, research facilities opened their doors with experiments and exhibitions from "Wissenschaft zum Mitmachen und Anfassen" (Hands-On Science). Scientists bearing "Talk to a scientist" signs were there to answer any questions. 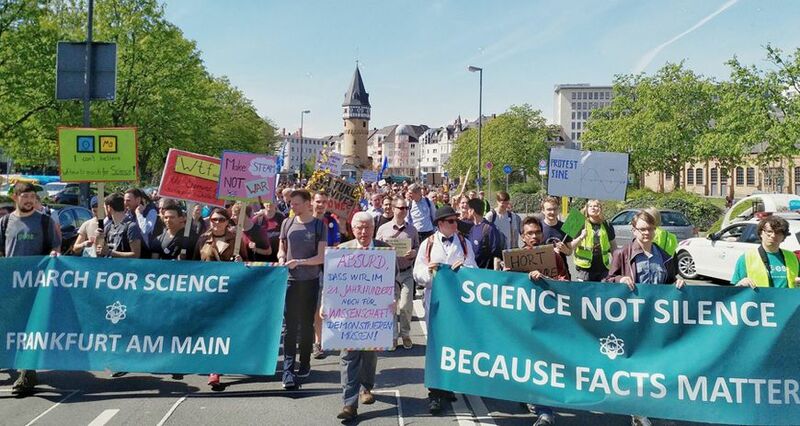 The March for Science has also been accompanied by hands-on activities like interactive exhibitions and scientists answering questions in Göttingen. On 04/12/2018 in Jena, scientists, politicians, and journalists discussed the autonomy and freedom of science and research. Several "science pubs" are scheduled to follow this over the next few months. This will bring scientists into conversation with interested members of the public at cafés. In Kiel, there were short presentations and a light show during the evening of 04/13/2018. Panel discussions, science pubs, "Kieznerds", and hands-on science – the March for Science was more than 'just posters' this year. But it will only be a success if also in future as many people as possible avail of what science is offering and get involved in the dialog. Additional information regarding all of the events can be found on the "March for Science e.V." website. "Science is international" Helmholtz President Otmar D. Wiestler explains why he supports the movement.